Famous people born on SEPTEMBER 4, normally are the kind of people who don’t rely on others. They are pretty clever and are not afraid to put in work. The original ideas of these Virgos have promise as they put them to the test. However, they do not like to take risk unnecessarily. They let their friends do this while they take notes and enjoy the stories. As a distinctive attractive personality, they don’t have any problems making or keeping friends. However, they and their family may not see eye to eye on matters and are not as close as they would like to be. It can be difficult for them to show their true feelings though. When it comes to their job, famous September 4 celebrities resent the presence of a time clock. Needless to say, they will have a few occupations before they find the one that is right for them. It’s okay though as they know how to hold on to their money so when times get hard, they have a safety net to count on. Famous people born on September 4th are a Virgo who could be described as a miser. However, they are not egotistical. 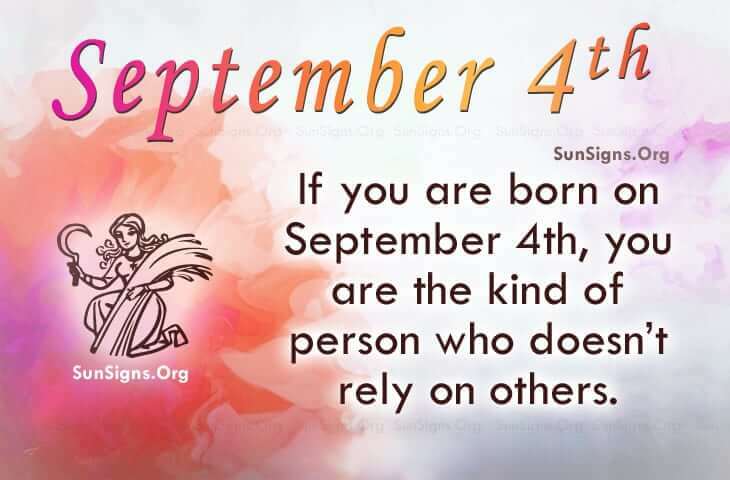 The September 4 famous birthday horoscope shows that they are smart and independent. Friends come easily to them, as they are beautiful and dangerous. They have a smile that will melt anybody’s heart.